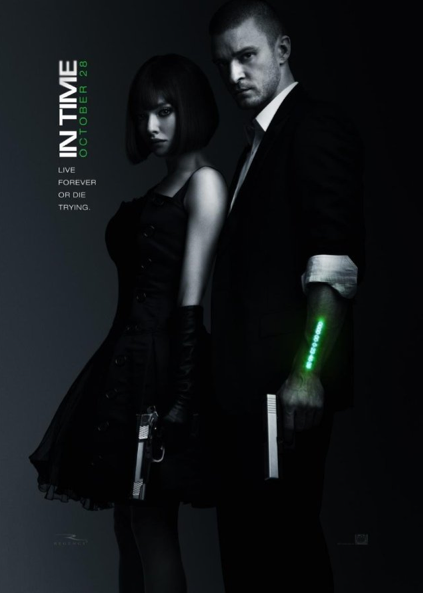 I've heard In Time described as a remake of Logan's run, or a 'lighter' version of Inception or The Adjustment Bureau (perhaps a film having the same feel, but with less to think about), some have said that it's basically an episode of The Twilight Zone streatched out to feature length film. These ideas have some validity, but none do the film its due justice. What makes this review difficult is the fact that, although I quite liked it, it worked and is generally a good film, what's wrong with it is more remarkable than what's right with it. We're given a quite heavy-handed explanaition of the premise of the film during the opening credits; due to overpopulation, humans have been genetically engineered to stop aging at 25, and live for a further year, but for accumulating more time on a glowing green digital stopwatch GE'd into their arms, which in turn makes 'time' the new currency. We see and understand the world, and there'll be no mystery for us to unravel. I didn't really need that. I didn't really need Justin Timberlake either, his range is painfully narrow and his screen presence is entirely forgettable. Cillian Murphy gave us some gravity and not much else, and it may be revealing to add that the most interesting performance came from Amanda Sayfried. Beyond the wishy-washy performances is wishy-washy dialoge. A few razor-sharp one-liners, although not unappreciated, couldn't make up for what was ultimately a naff screenplay. Ultimately, In Time suffers from that all-too common problem in Sci-Fi in that an excellent idea is handicapped by poor, smarmy execution. Just as George Lucas is prone to taking one or two great ideas and holding back the film from the greatness it deserves with his neglect of other elements, so does Andrew Niccol in this venture. I would have liked to have seen some new technology for a film set so far into the future, but ultimately didn't miss it. Niccol does however make a new twist on the 'used future' concept by populating his city with futurised muscle cars, and I like that, it really works. The colour pallate, too, which has lately become a shortcut to giving a film an other-wordly feel is done well. In Time could have been much more Great ideas without great follow-through, but still a watchable and enjoyable film, much better than the volume of mentionable flaws might have you believe. I'm looking forward to a remake in 20 or 30 years time.